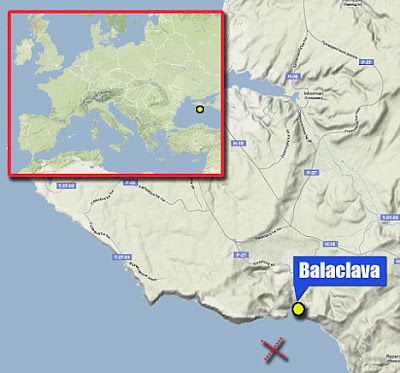 BALACLAVA, Ukraine -- Archaeologists say they have discovered the wreck of HMS Prince, a British naval vessel which sank near the port of Balaclava during the Crimean War. Wreck: The HMS Prince sank in a storm near the port of Balaclava during the Crimean War in 1854, killing 144 of its crew. Some 144 men on board the ship were killed after it sank during a storm in November 1854 and thousands of badly needed winter uniforms were also lost. Although underwater expeditions have previously found parts of the ship, this is the first positive identification of the vessel. Sergei Voronov, of the Ukrainian Academy of Sciences, said divers had discovered a plate fragment from the captain's mess last summer. After months of meticulous cleaning, the fragment revealed the name of the company which owned HMS Prince before it was hired by the Royal Navy - the General Screw Steam Shipping Company. Mr Voronov and his colleagues are hoping to attract international support to explore another ship which also sank during the Crimean War. HMS Prince was lost during a hurricane force winter storm during the historic siege of Sevastopol, which was then part of the Russian Empire. Only six of her crew survived. The 2,700 ton ship was at deep water anchor outside the port when high waves tore it from its anchor and it was dashed on to rocks. The sinking caused outrage in Britain with soldiers suffering from the extreme cold and widespread disease in what is now the Ukraine. The Crimean War, which lasted from October 1853 to February 1856, saw the Russian Empire against an alliance of the British, French, the Ottoman Empire and the Kingdom of Sardinia. It was during the war, at the Battle of Balaclava, that the ill-fated Charge of the Light Brigade took place where 272 British soldiers died. The Crimean War was the first to include the tactical use of railways and telegraphs. A total of 374,600 people died during the conflict, many of them from disease. It also led to the establishment of the Victoria Cross in 1856, the British Army's first universal award for valour.